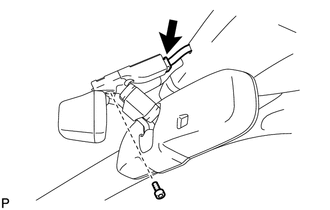 (a) Disengage the 2 claws and slide the inner rear view mirror stay holder cover as shown in the illustration. 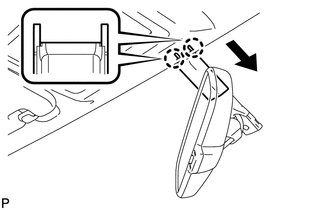 (b) Disengage the 2 claws and remove the inner rear view mirror stay holder cover. 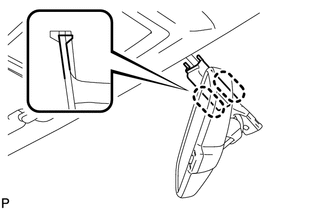 (b) Using a T20 "TORX" socket wrench, remove the screw and the inner rear view mirror assembly. Do not touch of the camera lens (built into the inner rear view mirror assembly) with a bare hand. 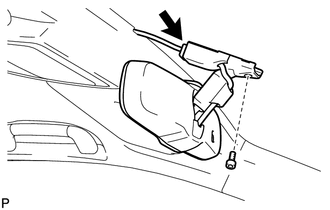 Do not apply strong impact to the inner rear view mirror assembly. Do not allow any liquids to get on the inner rear view mirror assembly.